(Re-)reading Kevin Gilbert’s poetry | Me fail? I fly! According to his Wikipedia entry, Kevin Gilbert (1933-1993) was an ‘Indigenous Australian activist, artist, poet, playwright and printmaker’. His first play, The Cherry Pickers, which he wrote when in prison. made a splash in 1970 or thereabouts. A Wiradjuri man, he played a role in setting up the Aboriginal Tent Embassy and was part of the Black Power group. He wrote a book for children, Child’s Dreaming (1992), from which we published a number of poems in The School Magazine, and a sweet memoir for child readers, Me and Mary Kangaroo (1994). I own a copy of his first published book, End of Dream-time, number 104 of the edition of 200, and it’s sitting on my desk as I type. It’s a beautiful object, handset and printed on creamy, textured paper, with illustrations by the author in a range of single PMS colours. Phil Roberts, the poet founder of Island Press, treated his early books as labours of love. Of those on my bookshelves, this is the one most lovingly laboured over. The presentation is a clear message to anyone tempted to read the poems as sociological specimens (a book by an Aboriginal man was a rare thing in the early 1970s, and any spurious sociological appeal was made all the greater by its having been at least partly written when Gilbert was in prison for murder). These poems, the design announces emphatically, are to be read and respected as poems. I’ve adopted writing as a means of voicing the Aboriginal situation … I try to present as truly as possible the Aboriginal situation and the Aboriginal response. There is the need to educate White Australians to the present situation of Aboriginal people … I’m presenting it as honestly as possible – it’s not a pretty picture. So I went out and bought a copy of People Are Legends, published seven years later by the University of Queensland Press. The back cover describes these poems as written ‘in the language used by living Aboriginals, without editing, without politeness or hypocrisy as practised in “cultured” verse’ (my bold). Or silently becomes a slave. But then, these poems aren’t aiming to give me a good time or lay out a workable political agenda. This was trail-making work: I don’t know that anyone would try to write poems about ‘the’ Aboriginal situation and response these days, and that’s due in part to Kevin Gilbert’s rising to the challenge to educate, to speak as a representative. When the ghosts rise I ain’t brave! Kill’d two horses; rode to death. Really, it’s a poem that cried out to be anthologised. And one last note: in Child’s Dreaming, published a couple of years before his death, Gilbert showed that he could relax when the burden of being a representative was eased. 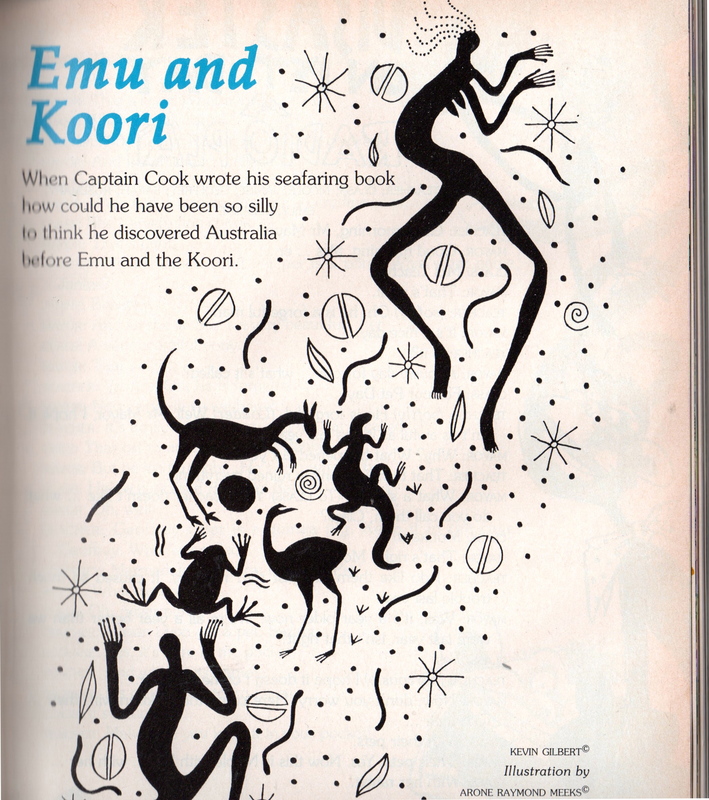 There was still the element of protest, but without the same bitterness and despair (see ‘Emu and Koori’, as reprinted in The School Magazine with an illustration by Arone Raymond Meeks, in the left-hand image below). 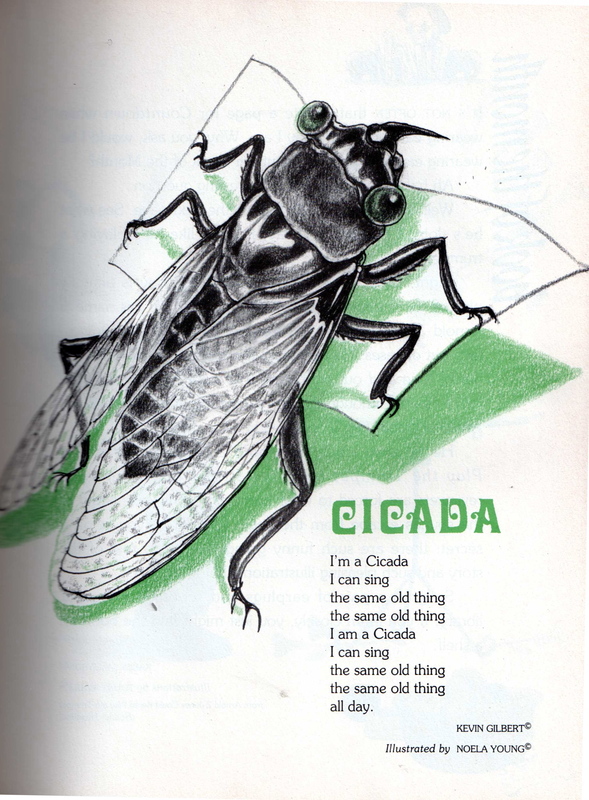 ‘Cicada’ (image by Noela Young) may not be everyone’s cup of tea, but it’s given me much pleasure. ‘Eagle’ (illustration Aart Van Ewijk) is just plain genial. 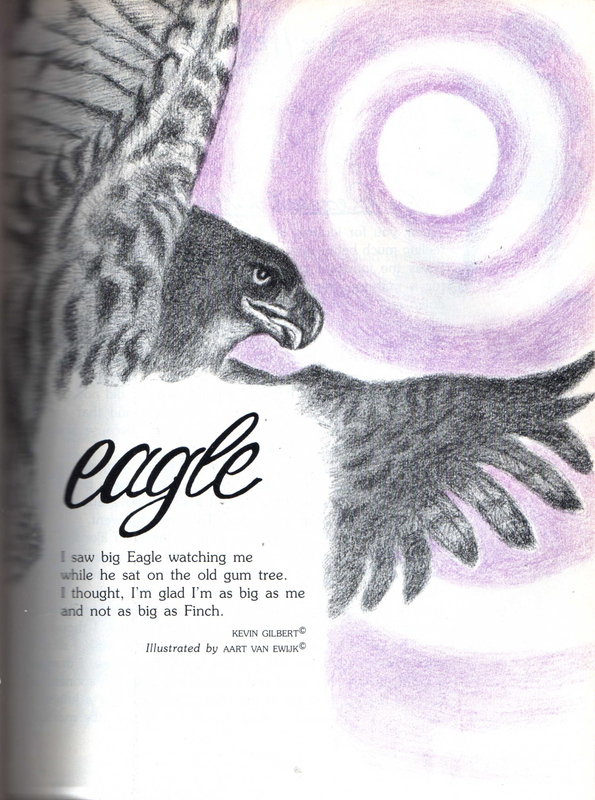 This entry was posted in Books and tagged Aart Van Ewijk, Aboriginal and Torres Strait Islander, Arone Raymond Meeks, Geoffrey Lehmann, Kevin Gilbert, Noela Young, Philip Roberts, Robert Gray, The School Magazine. Bookmark the permalink.